In a rare moment of unity, Micheál Martin and Gerry Adams burst out laughing, raised their hands and applauded the star turn. What on earth had the Taoiseach done to earn the merry approbation of the Fianna Fáil and Sinn Féin leaders who are usually unimpressed by his performances in the Dáil? Had Enda burst into song, or announced that he was defecting to Renua? Nothing of the sort, alas. He had been in full flight defending his response to the latest hoohah involving IBRC, Siteserv and businessman Denis O'Brien. Micheál had been excoriating him over what he regarded as the Taoiseach's Trappist-like silence on the legal fracas surrounding the injunction, pointing out that Enda had recently aired his opinions on "subjects as diverse as Sepp Blatter and bottle-banks". He got it in the neck from everyone. 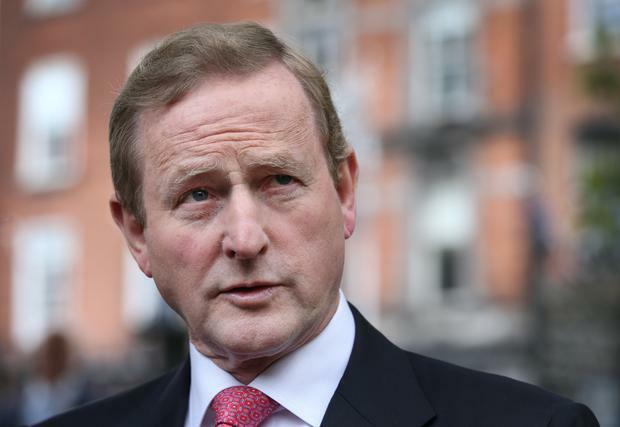 By the end of the lengthy fusillade of accusations, Enda was wearing his wounded look. "I've been a supporter for a very long time that Dáil questions being answered should be answered as fully and as completely as possible …." he replied gravely, before the rest of the sentence was drowned out by theatrical guffaws of incredulous laughter from the front-row seats facing him in the Dáil parterre. "It's an art form," cheered an admiring Padraig MacLochlainn. Everyone's a critic these days, but the acclaim was, of course, utterly ironic. What the Opposition audience was in fact acknowledging was the Taoiseach's clearly visible brass neck, gleaming in the afternoon sunshine. For even Rob Kearney, Irish rugby's formidable full-back and deadly line-kicker, would be put to the pin of his collar to match the dogged skill of Team Enda in booting tricky balls into touch. Or to be precise, in blazing them sky-high into the stands, over the wall, anywhere at all out of view. As a general election starts to loom on the horizon, the one aim of the Government is not to do anything rowdy to scare the horses between now and then. Just steady as she goes and say nothing to nobody wherever possible. Or, failing that, when the clamour for answers cannot be ignored, unveil a brand new Commission of Investigation which promptly removes the ball from the pitch. And so, as the ruckus over the IBRC imbroglio grew ever more strident and the war of words between various interested parties grew increasingly bitter, the Finance Minister announced a Commission of Investigation into transactions conducted by IBRC. The terms of reference were debated at length throughout the evening, throwing up some new information, including documents produced by Pearse Doherty which revealed that businessman Denis O'Brien made four attempts to extend a loan and eventually got an extra 12 months to make repayments on €315m. He said it raised "serious questions" about how IBRC was run. Mr O'Brien's banking arrangements with IBRC were under scrutiny, but Mr Kenny was also in the firing line. Given that the Dáil had been off last week while the controversy raged on the airwaves and in the High Court, yesterday's Leaders' Questions was the first opportunity the Opposition had to go in with boots flying on the Taoiseach. And they got stuck in, berating Enda for his refusal to recall the Dáil last week to debate the issue. "Were you afraid to confront the issue and the person? Why were you willing to remain silent and indifferent to attempts to stifle legitimate debate?" demanded Micheál. Enda was most indignant at the notion he had gone to ground last week. "I had five public engagements on the Friday and the same on the Saturday and Sunday in other locations," he assured Micheál. (Though the nearest he came to a bank was attending the opening of a bottle-bank). "The request made of me was to recall the Dáil. An injunction was granted by the High Court. A case was before the High Court. This House could have met on the Sunday, Monday and Tuesday and talked itself around in circles. It had no authority and no function in interfering with the court case," he shrugged, as he watched the ball soar away into the distance.